While not all-inclusive, the above list demonstrates the fact that 1950s Radio had necessarily moved toward "name" actors to lead most of their more successful 1950s mystery, detective and crime programs. These names were essential to go head to head with early popular Television. In fact several of the above Radio programs transitioned to Television during the late 1940s and 1950s--in some instances concurrent with, or on the heels of, their Radio counterparts. One of the above cited name star mystery and adventure vehicles for NBC was Rocky Fortune (1953-1954) starring Frank Sinatra. The abrupt departure of Frank Sinatra and his Rocky Fortune during the Spring of 1954 left a big hole in NBC's Tuesday night mystery lineup. 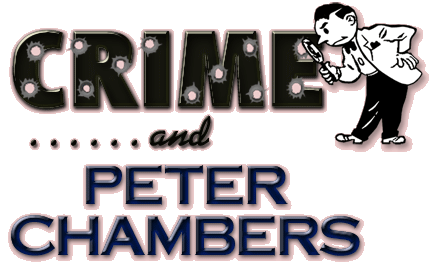 Mystery novelist Henry Kane approached NBC to pitch his 'Peter Chambers' character from eight of his detective novels as a candidate Radio program. He'd wisely enlisted the interest of popular Film tough guy Dane Clark prior to pitching the concept to NBC. Presenting NBC with a fait accompli was the right combination for all parties. NBC quickly regained a name Film talent for their Tuesday night mystery lineup to follow Dragnet, and Henry Kane got full control over the production, credits as creator, writer and producer, and the chance to promote his Peter Chambers character even further. First teased in the trade papers as The Affairs of Peter Chambers, much in the vein of The Affairs of Peter Salem (1949-1953), cooler heads prevailed and the production ultimately debuted--sustained--late Tuesday night, April 6, 1954 as Crime and Peter Chambers. A New York based private detective, Peter Chambers was promoted as a detective that, rather than always at odds with local police counterparts, actively participated with and supported the detectives of the NYPD, much in the mold of Philip Marlowe (1947-1951) over Radio. Peter Chambers apparently lived quite comfortably in the upper east side of Manhattan. Detective Lieutenant Louie Parker (William Zuckert) had not only a respectful professional relationship with Peter Chambers but the two had apparently become friends of some seventeen years. Peter Chambers (Dane Clark) had no particular love interest during the comparitively short-lived series, so he was free to play the field with many of the more attractive females he encountered during the series. 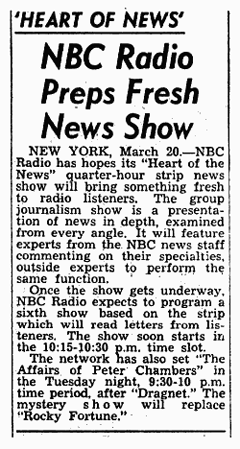 There'd been little time to interest potential sponsors in the project but NBC, as was its practice throughout the period, heavily employed Crime and Peter Chambers to promote other programs in NBC's lineup throughout the Spring and Summer of 1954. With only three professionals on the production side--Director Fred Weihe, Announcer Fred Collins, and Creator, Writer and Producer Henry Kane--the production remained fairly tight and lean throughout the run. Crime and Peter Chambers also supported Dane Clark with New York's finest voice talent including Elaine Rost, Everett Sloane, Leon Janney, Patricia Wheel, Roger De Koven, William Griffis, Donald Buka, Joe de Santis, Bryna Raeburn, Ralph Bell, Guy Repp, Lawson Zerbe, and Nelson Olmsted among many others. As with many of the late 1940s through 1950s productions featuring a major Film star headliner, most networks spared little expense obtaining the finest supporting talent they could acquire to support their star(s). The series' positioning in the Tuesday night lineup immediately following the wildly successful Dragnet with Jack Webb also helped to buoy the success of Crime and Peter Chambers throughout the Summer of 1954. For Dane Clark's part he was both believable and engaging as Peter Chambers. Most of his more memorable Film roles had been as a young, life-hardened tough. We found his role as Peter Chambers a refreshing change for Clark. He clearly established that he could carry a highly sympathetic, commanding characterization, he showed a surprising sense of humor and occasional comedic timing, and from the premiere episode forward Clark showed complete command of the role. There's little question that he could have quite easily assumed further similar leads over the following years. About halfway through the twenty-six episode run, NBC announced its acquisition of the popular Lux Radio Theatre from CBS. Lux Radio Theatre, though having got its start over NBC in 1934, had aired continuously over CBS for eighteen years between 1936 and 1954. Reacquiring Lux Radio Theatre was a major coup for NBC and NBC used many of the programs in its Tuesday night lineup to promote Radio Theatre's return on September 14th of 1954. When September 14th finally arrived, Lux Radio Theatre took Crime and Peter Chambers' timeslot over most NBC affiliate stations though some regions of the U.S. continued to air Crime and Peter Chambers through to its twenty-sixth episode. Dane Clark, by then running his own production company and at the peak of his professional drawing power, moved on to other projects in Film and Television. Henry Kane went on writing mystery novels and for Television. The Peter Chambers character appeared only in print after the NBC Radio production ran its course. Almost 40% of the circulating episodes of Crime and Peter Chambers come from AFRTS-denatured recordings from its END-515 [ENtertainment, using Domestic Network broadcast material] series. In a rational world, one might naturally applaud and express indebtedness to the AFRTS for preserving this rare canon for posterity. Unfortunately the irrational OTR Community chooses to both ignore the AFRTS' dedicated preservation efforts and routinely employ the AFRTS-denatured recordings as 'stem cells' from which to clone or fabricate a more complete, commercial, as-broadcast run of a canon than actually exists. Misrepresenting AFRTS-denatured recordings of Crime and Peter Chambers as exemplars of as-broadcast recordings is simply fraud--not to mention the insult to the dedicated men and women of our Armed Forces who so diligently preserved this national treasure for posterity. Over two-thirds of the circulating exemplars have been stereo-ized. This is the abominable practice of creating counterfeit, adulterated quasi-stereo recordings from two identical monaural tracks simply to give the impression of a far higher quality encode than the original source recording. The circulating titles applied to the canon over the years are predominantly inaccurate. There were no announced titles during the run of Crime and Peter Chambers. All circulating titles are anecdotal, which would be fine if they were remotely accurate--or at least properly spelled. The vast majority of the previously circulating titles applied to the canon by commercial OTR vendors and OTR Groups were casually assigned using the infamous 'OTR Rule of Title Naming'--simply listening to the first two minutes of a recording to derive a title, no matter how contrived. This silly practice is not only intellectually dishonest, it's simply lazy and sloppy. At least three of the currently circulating exemplars appear to be sloppily edited AFRTS-denatured recordings in an attempt to disguise their orgin. The absurdity of this practice is that, for Radio historians and collectors of integrity, the AFRS and AFRTS-denatured recordings are often even more prized than their more commonly available as-broadcast counterparts. Destroying or disguising the AFRTS origins of many of these recordings is simply OTR fraud and vandalism. Frank Sinatra's first venture in radio Who-Dun Its, "Rocky Fortune Hunter of Jobs," is ended after 26 Tuesday nights on N.B.C. reason given other than end of contract. Starting tomorrow in its place will be taken by "Crime and Peter Chambers," another mystery, with Dane Clark playing a private detective. 8:35 p.m.--Crime and Peter Chambers (WIBA): new series with Dane Clark as private detective. 9:35-10--Crime and Peter Chambers: With Dane Clark and Others--WNBC (Premiere). Another crime show is added to radio's schedule at 9:35 p.m. today, WSYR, replacing the Frank Sinatra series, Rocky Fortune, which has been cancelled. Crime and Peter Chambers is the new thriller, starring Dane Clark as a hard-hitting private eye. The series is based on the character created by Henry Kane who wrote eight Peter Chambers novels. Kane will write the scripts about the "detective who cooperates fully with the police." 8:35 p.m.--Peter Chambers (WIBA): blackmail and narcotics case. 9:35-10--Crime and Peter Chambers: The hero finds he's a murder suspect, with Dane Clark--WNBC. After the close James Stewart promotes The Six Shooter on a new day, Thursdays. 9:35-10--Crime and Peter Chambers: Private-eye drama, with Dane Clark and others--WNBC. After the close Eddie Cantor promotes his NBC program. 9:35-10--Crime and Peter Chambers: A private-eye finds he's skirting the edge of suspicion himself, with Dane Clark and others--WNBC. 9:30-10--Secretary of the Treasury George Humphrey, Senator Harry F. Burd, others; At Government Economy Rally from Town Hall--WNBC; 11:30-11:55--Recorded--WOR. WRC 9:30 News; The Gov't. Economy Rally. 9:30-10--Prime Minister Winston Churchill, the Duke of Edinburgh, Clement Atlee, others; At English-Speaking Union Dinner in honor of General Alfred M. Gruenther, London (Recorded)--WNBC. WRC 9:30 News; Crime and Peter Chambers. WFAA-WEAP 8:30 Swayze News; Crime and Peter Chambers. 54-05-25 Portsmouth Herald - WBZ 9:30 Peter Chambers. 9:05 p.m. KNBC  Crime and Peter Chambers, starring Dane Clark. 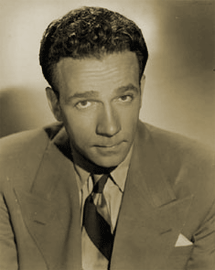 It being mystery night on WSYR radio, Barrie Craig, Confidential Investigator, will be heard at 8:30 p.m., Dragnet at 9 p.m., and Crime and Peter Chambers at 9:35 p.m. Barrie Craig, played by William Gargan, becomes involved in a case called "Kiss and Kill." After another Friday-Smith escapade on Dragnet, Peter Chambers visits a night club operated by three friends to find that one of the partners has been murdered. 9:05 p.m. KNBC--CRIME AND PETER CHAMBERS. (New Time)--Dane Clark as private detective Peter Chambers runs into an old friend who has been murdered. The Cufflink Is . . .
6:30 P.M. KFI-News; Crime & Peter Chambers. Announces Lux Radio Theatre's move to NBC in the Fall. Announces Lux Radio Theatre's return to the air on September 14th. Announces Lux Radio Theatre's return to the air in three weeks on September 14th. No mention is made of Lux Radio Theatre replacing Crime and Peter Chambers. Announces Lux Radio Theatre's return to the air in just two more weeks on Tuesday, September 14th. Max Daly -- Suicide or Murder? Max Dalely Has Committed Suicide? 9-10--Radio Theatre: "Wuthering Heights," with Merle Oberon and Cameron Mitchell--WNBC (Premiere). WRC 9:00 Lux Radio Theater. Dane Clark, movie, radio and television star who recently became a movie producer, will emcee the 15-hour celebrity parade for cerebral palsy beginning at 10 p.m. Saturday on the stage of Municipal auditorium. The telethon will be simulcast over KGBS and KGBS-TV and the auditorium will be open to the public without charge. CLARK RECENTLY began his own motion picture production company in partnership with James Wong Howe, outstanding Hollywood cameraman, and their first film was "Go Man Go," the story of the Harlem Globetrotters. Clark played the part of their manager. Clark was a soda jerk and a prize fighter before gaining recognition in movies. He also appeared on Broadway, has starred on such dramatic television show's as Ford theater, and has his own regular N.B.C. radio program "Crime and Peter Chambers." He also holds a law degree from Harvard. Clark's first telethon experience was gained in Mobile, Alabama during a 20-hour show. Ed Kemmer, who plays Corry became interested in acting during World War II, when he and other prisoners in a German prison camp produced plays for their own amusement. MORE THAN 500 volunteers, including 300 members of the Communication Workers of America, will work in the all-night show, verifying donations, manning telephones and doing other chores. Checker cabs and the Manhattan cafe will again donate their services toward picking up donations and serving refreshments to entertainers and workers. major portion of the funds raised will remain here for that purpose. LOS ANGELES--Dane Clark, an actor whose career on stage, film and television spanned over 50 years, died Friday. He was 85. Clark started acting in the 1930s with the Group Theatre in New York. He went to Warner Bros. in the 1940s, and later acted with Humphrey Bogart and Raymond Massey in "Action in the North Atlantic." Clark joined Cary Grant and John Garfield in "Destination Tokyo" and worked with Garfield again in "Pride of the Marines." His other film credits include "Hollywood Canteen," "A Stolen Life" with Bette Davis, "Without Honor" with Franchot Tone and Agnes Moorehead, and "Go Man Go" with Sidney Poitier. After leaving Warner, Clark worked for J. Arthur Rank in London and made several films including "Highly Dangerous," "The Gambler and the Lady," and "Blackout." In France, Clark worked with Simone Signoret in "The Haunted." Clark starred in television series' such as "The Jimmy Dean Story." He also was a guest on numerous television shows, including "Twilight Zone," "The Name of the Game," and "Cannon." His last film was "Last Rites" with Tom Berenger in 1988.